Objective: Wegener’s granulomatosis is a systemic vasculitis, characterized by multifocal vascular necrotizing inflammation and granulomatosis that affects small and medium-sized blood vessels. It is associated with antineutrophil cytoplasmic autobody and causes alveolar hemorrhage and renal insufficiency leads to high mortality rates. Extracorporeal membrane oxygenation (ECMO) is a supportive treatment choice for patients with severe respiratory failure. We present an ECMO application to 64 year-old female patient with acute alveolar hemorrhage and respiratory failure due to Wegener’s granulomatosis under CPR. Case Report: A 64 year-old female patient, previously diagnosed with chronic renal failure due to Wegener’s granulomatosis, admitted to our hospital for routine hemodialysis programme. At the end of the first hour of hemodialysis a worsening in her general condition occured and she required intubation and mechanical ventilation. 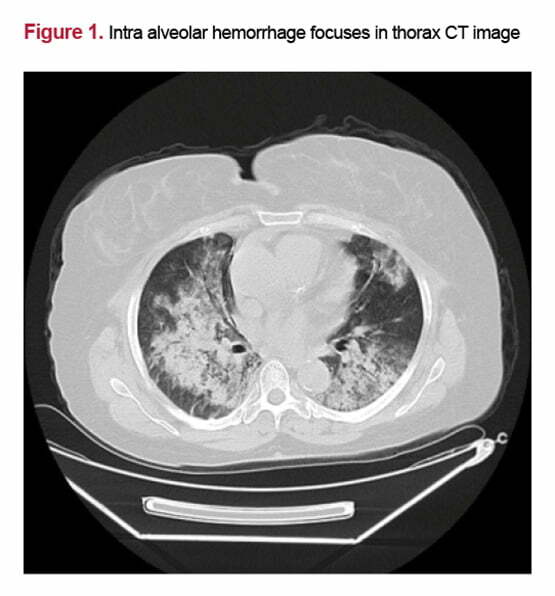 Computerized thorax tomography revealed bilateral intraalveolar hemorrhage. Although proper medical therapy the patient had respiratory arrest. Despite successful CPR, adequate oxygenation couldn’t be reached, and ECMO treatment was initated. Clinical, radiological and laboratory findings showed improvement two days after ECMO initation but the patient died due to multiorgan failure in the fifth day of the therapy. Conclusion: Diffuse alveolar hemorrhage is a life-threatining complication associated with Wegener’s granulomatosis. Mechanical ventilator dependent respiratory failure may develop and this process can be mortal. ECMO is a reasonable management option for such clinical situations. In this study we report an ECMO application to 64 year-old female patient previously diagnosed with Wegener’s granulomatosis with acute alveolar hemorrhage and respiratory failure. A 64 year-old female patient, previously diagnosed with chronic renal failure due to Wegener’s granulomatosis, admitted to our hospital for routine hemodialysis programme with systemic anticoagulant. At the end of the first hour of hemodialysis therapy, haemoptysis developed in the patient. Her general condition continued to deteriorate and required intubation and mechanical ventilation. Computerized thorax tomography revealed bilateral intraalveolar hemorrhage (Fig-1). Although proper medical therapy the patient had respiratory arrest. The patient gave response to the CPR after 20 minutes, but adequate oxygenation could not be reached, pO2 was 42 mmHg and pCO2 was 75 mmHg thus, veno-venous (right subclavian vein-right femoral vein) ECMO treatment was initated at the bedside of the intensive care unit. Continue veno-venous hemodiafiltration was started as an additional therapy. Her oxygenation dramatically ameliorated after the begining of this procedure. pO2 levels increased to 76 mmHg and pCO2 levels declined to 41 mmHg. Haemopthysis decreased; clinical, radiological and laboratory findings showed improvement two days after ECMO initation. The ECMO lines and oxygenator were not covered. During the ECMO therapy, systemic anticoagulation performed with standart heparine to prevent coagulation in the system of ECMO. Systemic anticoagulation was started just before ECMO set up. APTT levels was tried to kept around 80-100 seconds, thus two-hour APTT controls were performed. There was no serious worsening in clinical situation due to heparine but hemoglobin and hematocrit levels decreased and leaking bleeding at the entrance of the cannula was seen.This clinical situation was achieved with blood transfusion. There was no thrombus or failure in oxygenator in following days. In the fourth day of the therapy clinical situation got worsening due to multiorgan failure. Although appropriate therapy including liver and kidney protective agents and antibiotics, patient died in the fifth day of ECMO therapy. 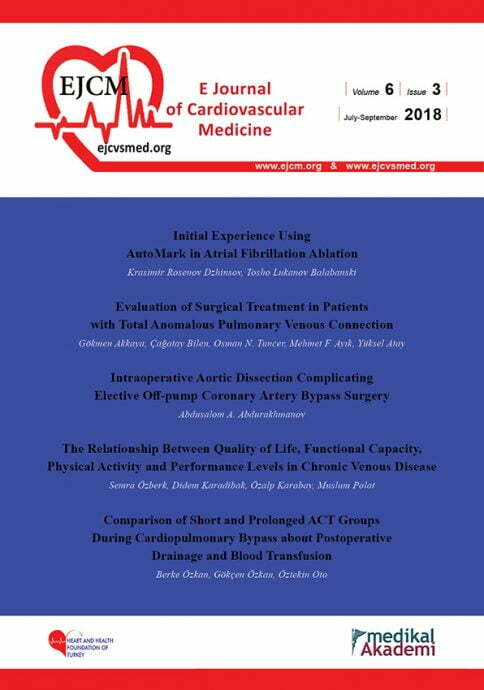 In a study Schmidt et al declared that veno-arterial ECMO is useful in cardiac or cardiorespiratory failure, while veno-venous is useful in respiratory failure without cardiac compromise. Additionally, respiratory ECMO can be used as a bridge to recovery to gain time for the treatment of underlying disease. (9) In conclusion, diffuse alveolar hemorrhage can be life-threatining clinical situations of the various vasculitis syndromes. ECMO is a reasonable management option for patients with diffuse alveolar hemorrhage associated severe, refractory hypoxemic respiratory failure as a respiratory support to maintain life and supportive therapy providing time for diagnosis and treatment of the underlying causative disease until its control or resolution.